My fiancé and I have two extra left feet between us. Still, we are committed to learning how to dance. We’d been talking about taking dance lessons since before we were engaged and thought the wedding was the perfect excuse to get serious about it. 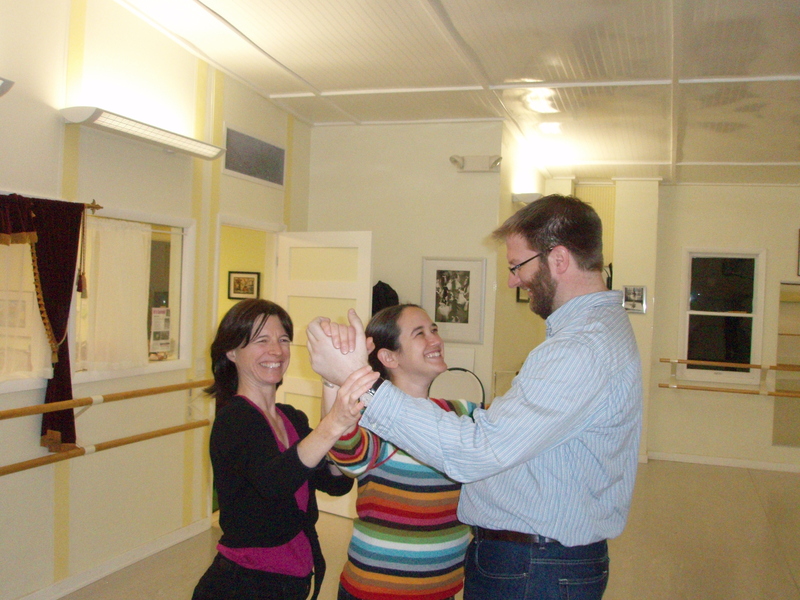 Over a year ago, we tried a group salsa dance lesson at a bar in Arlington, VA. It seemed like the perfect Saturday night date. We paid a few dollars at the door, ordered mojitos and started to bop to the music in preparation. The bar slowly started to fill up and then the instructors arranged us in two lines, leaders and followers. The instructors, armed with cordless microphones, began to swoosh, click their heels and shout complicated dance moves. We found ourselves dancing more slowly than the other couples and moving towards the edge of the dance floor. Eventually, we were sitting and watching the action. We weren’t built to move like that. When we moved to Ann Arbor, Michigan, we tried another group lesson. This time it was ballroom dancing. The price was right and it was on a Sunday evening. It seemed like a good way to work off a heavy Sunday night spaghetti dinner. Again, we couldn’t hack it. The female instructor didn’t have a microphone and her skirt was so long that I couldn’t see her feet. I had no idea what was going on. When I looked across the room to make eye contact with my fiancé in the line of “leaders,” I saw a similar look of confusion. Eventually, we left early and settled into a night of Entourage and True Blood on HBO. We knew we needed private lessons. I looked in the local Ann Arbor paper and started to Google and email folks. I spoke with some instructors and we tried out a few classes. Eventually, we found a class at Kenville Studio in Ann Arbor (http://www.kenvillestudios.com/) with Louise Tamres. We took a weekend Social Dance Survival class and loved it. She taught us a few moves in an hour and a half which we were able to do. Towards the end, we were dancing to a big band song and we were completely in rhythm. I looked up and we both had tears in our eyes. We walked home talking about our wedding and all the places we could go dancing in the future. Dancing was like a first date with sparks. We signed up for a six week Foxtrot class with two other couples. Sure, we still have those extra left feet, but we are making great progress. Louise explains things clearly and makes sure that we enjoy dancing. We look forward to future classes. Shop around and speak frankly with the instructors about your goals. The prices and options vary greatly. The prices are more reasonable if you don’t take a class labeled “wedding dance class.” I assume the content is similar, but the price tag isn’t. Start dancing early, especially if you have little dance experience. This is a skill you can carry with you for life, not just for your wedding day. Have fun! Couples who have been married for years sometimes complain to me that they don’t go out on dates anymore. This is a great date. And as with anything, practice, practice, practice.